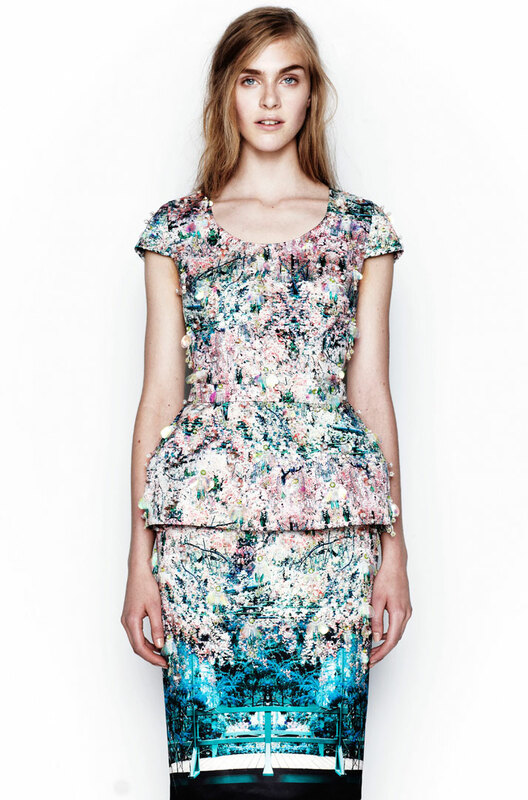 For fashion followers of Mary Katrantzou, there’s a lot to be excited about. With two completely different collections which still however feature her signature style, this label never fails to impress. Once more, we’re mesmerized by the prints, the motifs, the journeys and the structure of her creations. 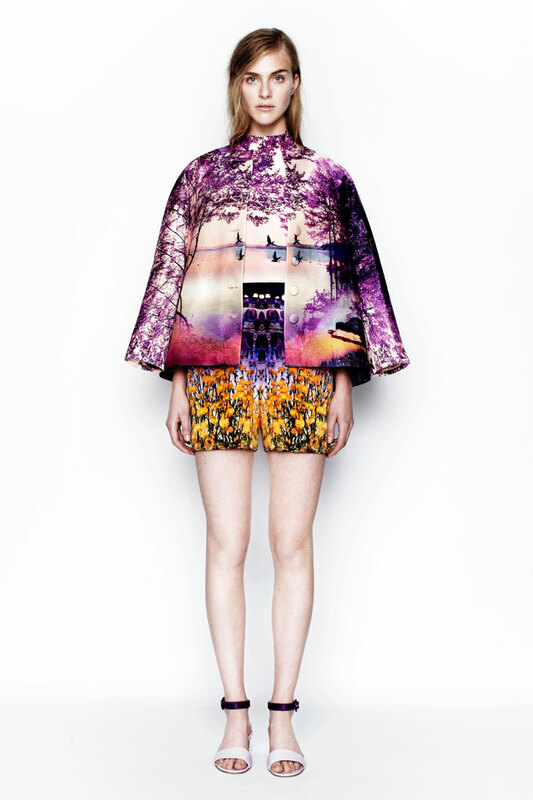 Resort 2014, photo © Mary Katrantzou. Firstly, we’re excited to present her first ever RESORT collection for 2014. 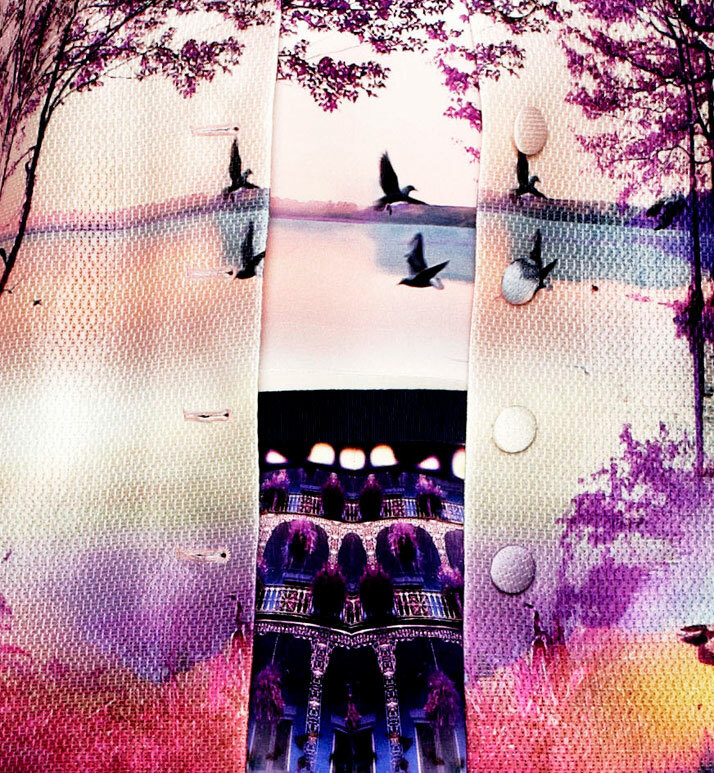 This line is the new opening to the designer’s romantic and vibrant side where the prints are all about magic paradises, Japanese mystical lakes and the incorporation of Eden. Colours, landscapes and shapes unite, bringing us into a mythical floating world. Looking at the vibrant flower colour palettes in each piece, it is truly breathtaking how your eyes and mind travel into the most sacred of imaginary gardens. By looking at these pieces you are captivated with their beauty and their ability to inspire a certain lifestyle. With the continuous patterns that flow from each garment, the essence of realism, harmony and balance is perfectly harmonized. 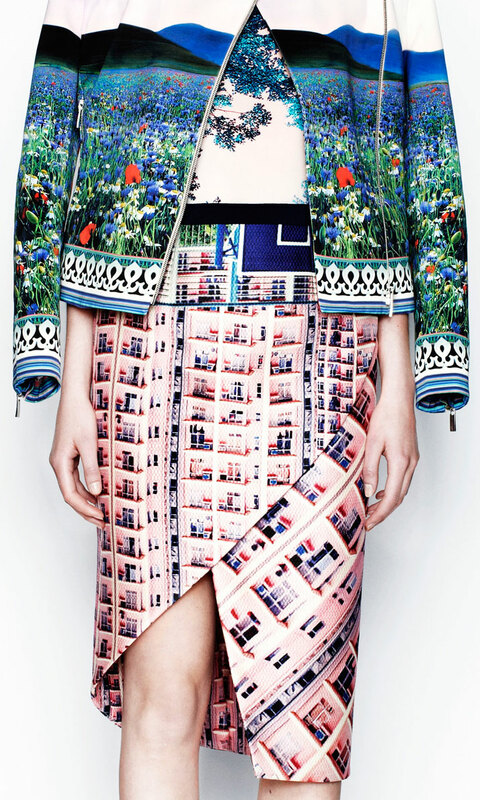 Moncler M by Mary Katrantzou, photo © Moncler. Describing this collection is like describing art work full of emotion and character. 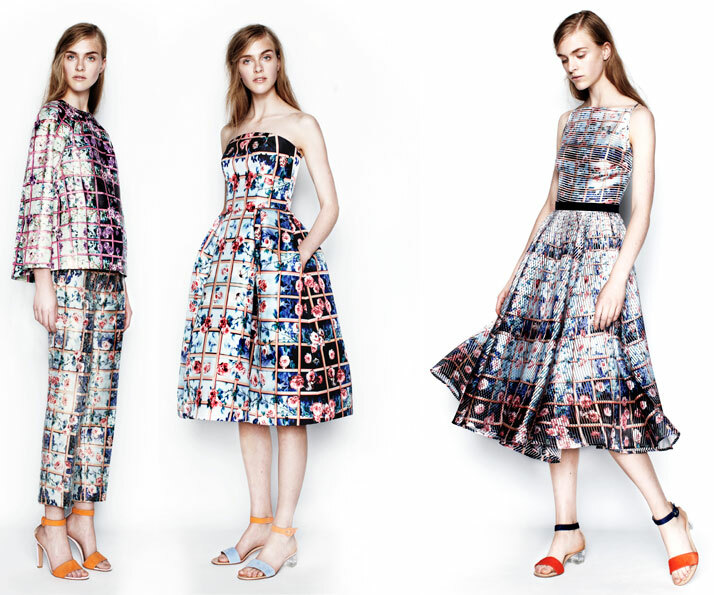 Of course Mary Katrantzou’s structural reference to design is still apparent but now it is somewhat softer and has taken a step back, leaving us to be captivated by the Resort collection itself. On a completely different, but yet equally exciting creation journey is the designer’s collaboration with Italian fashion houseMoncler for the ''Moncler M by Mary Katrantzou''. This unity has brought a new breath of fresh air into Moncler andKatrantzou retains the house’s characteristic style whilst bringing forth a different identity. 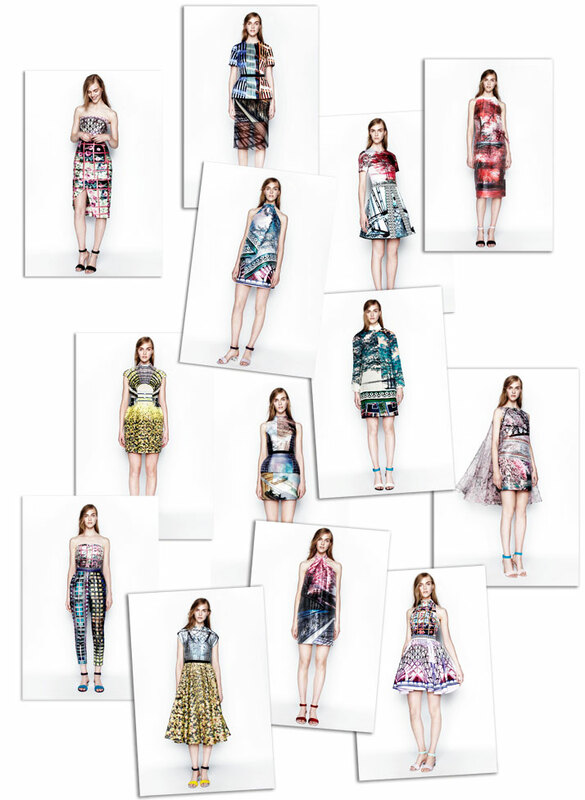 Structural, elegant and robust,Katrantzou’s creations lend great sexiness to Moncler’s signature timeless style. A world of great femininity also opens up through the merging of dark colours and heavy fabrics that feature in the strict garment lines. Although a successful unity between these two worlds may have seemed unlikely, with great respect for this timeless brand, this successful Greek fashion designer has introduced fluidity and poise with success. 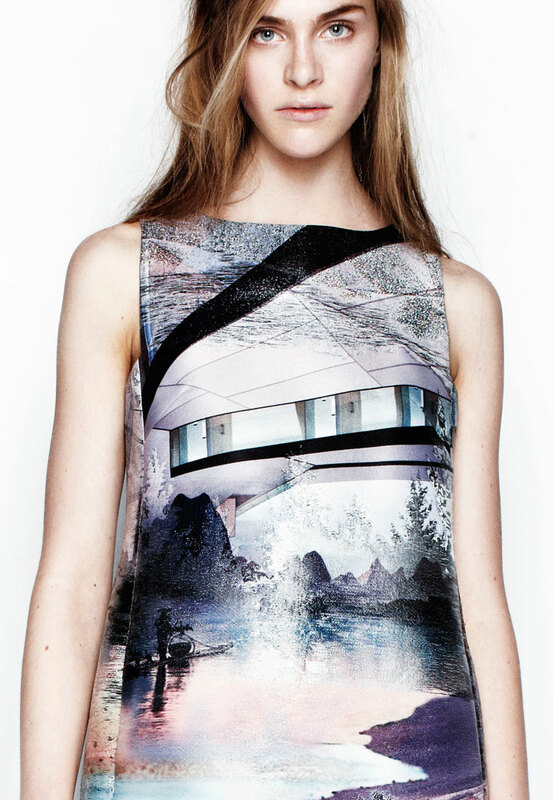 (detail), Resort 2014, photo © Mary Katrantzou. 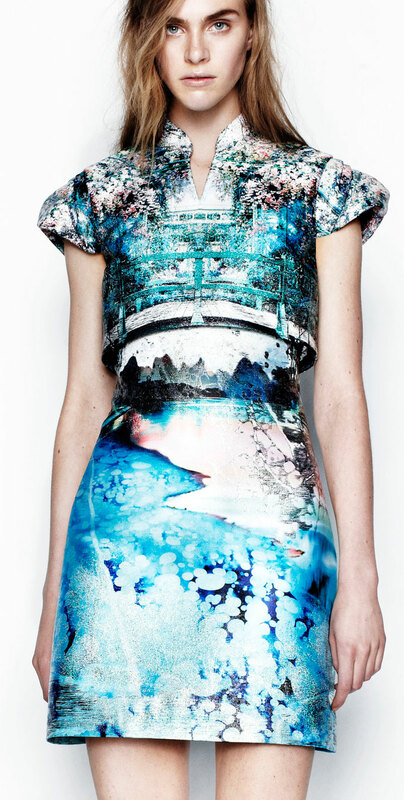 The designs are mostly based on a particular atmospheric palette while at the same time (and a surprise to us all) specific pieces were also created with a more dominant Katrantzou pattern. Like the opening of golden doors into a new world that could potentially lead in any direction, Chinese inspired motives are combined with turtlenecks and light coloured shapes creating a flamboyant world of spring, summer and winter all in one. To sum up, with Moncler M & Resort 2014, Mary Katrantzou has shown the fashion world that when it comes to their signature language, it is not lost in translation. Even on foreign ground, her strong style is recognizable. Be it a heavenly beach or mountain RESORT, this fashion house has captured both worlds. Discover the collections through the pictures that follow.